Today's "Presidential Executive Order on Promoting Energy Independence and Economic Growth" issued by the White House, is a fascinating and troubling read. While presumably rolling back policies of the previous administration, it also guts the US capability to make progress in meeting its commitments to the Paris Climate Agreement or responding at a policy level to climate change. Even if the U.S. does not officially withdraw from the Paris Climate Accord, it is clear from this Executive Order that there is no intention in seriously meeting our commitments in emissions reductions. Three actions are most troubling. First is the removal of the final guidance to Federal entities and bodies in considering climate change impacts in their activities. See Section 3, c.
Sec. 7. Review of Regulations Related to United States Oil and Gas Development. (a) The Administrator shall review the final rule entitled "Oil and Natural Gas Sector: Emission Standards for New, Reconstructed, and Modified Sources," 81 Fed. Reg. 35824 (June 3, 2016), and any rules and guidance issued pursuant to it, for consistency with the policy set forth in section 1 of this order and, if appropriate, shall, as soon as practicable, suspend, revise, or rescind the guidance, or publish for notice and comment proposed rules suspending, revising, or rescinding those rules. (iv) The final rule entitled "Waste Prevention, Production Subject to Royalties, and Resource Conservation," 81 Fed. Reg. 83008 (November 18, 2016). The third, and greatest concern is the utter disregard for climate change impacts on U.S. national security. In the Executive Order, it states, in Section. 3. "Rescission of Certain Energy and Climate-Related Presidential and Regulatory Actions." I find it ironic that a new administration that presumably has made national security a priority would revoke a previous Presidential Action that helped to specifically accomplish that goal. The previous action, now revoked, states that part of its policy implementation purpose was to partially implement, "the 2015 National Security Strategy, which identified climate change as an urgent and growing threat to our national security, contributing to increased natural disasters, refugee flows, and conflicts over basic resources like food and water. It added that increased sea levels and storm surges threaten coastal regions, infrastructure, and property, which in turn threatens the global economy, and compounds the growing costs of preparing and restoring infrastructure"
It is items iv, vi, xii, xv and xvi that bring the most concern. The new executive order is seemingly taking a Cromwellian approach to key information that would support the administration's efforts of making "America Great Again," and protect American interests and citizens for the long term future. We are left being blinded, bound in ignorance, and tossed adrift at the governmental level at a time that climate change is accelerating, destabilizing larger segments of global society, and decimating capabilities crucial to our current and future national security interests. By this Executive Order, our president is setting us up for - and participating in - the writing on the wall. Now tell me who will suffer for all your crimes? Recently, some media sources are reporting on the approach of Mauna Loa CO2 approaching or passing 410 ppm in 2017. 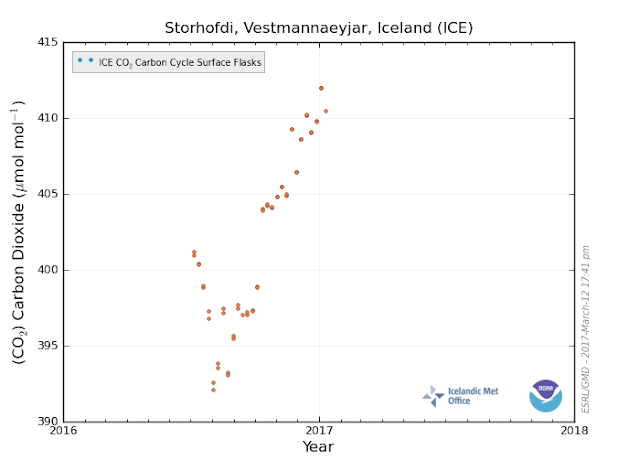 For example, Digital Journal reported on March 10, "In the next few weeks, carbon dioxide is expected to pass the 410 ppm mark on a daily basis at the Mauna Loa Observatory, something we have never experienced." While it is true that MLO has not passed 410 ppm in the past, it is helpful to note that this benchmark has already been exceeded elsewhere. The reality is that 30 monitoring stations exceeded daily readings of 410 ppm by June, 2016. The locations marked with yellow stars below are those who passed that point by that month. 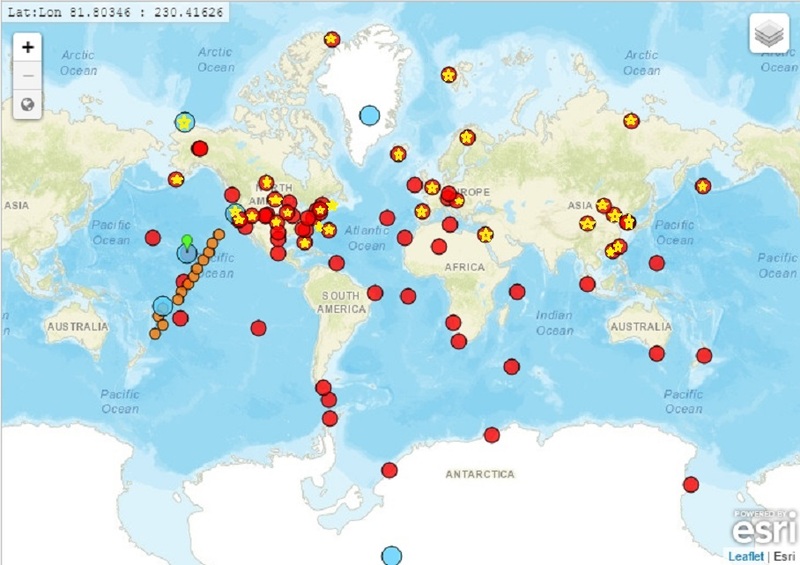 What is more concerning is how many stations have reported preliminary readings above 415 and in one case almost 420 ppm. For example, Barrow, Alaska has two preliminary readings above 420 ppm, that if not determined to be from a local source, will be a significant jump in CO2 concentration at that location. Cold Bay, Alaska had numerous readings above 410 ppm through 2016. and may approach 415 ppm this year. Ny-Alesund Svalbard has readings above 415 ppm in early 2017, which is not the peak of its CO2 cycle. 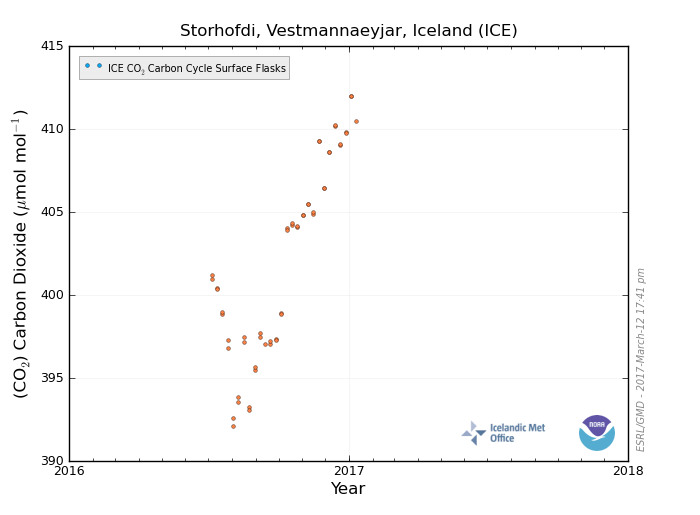 Further south, Iceland has already recorded preliminary CO2 above 410 ppm in 2017. 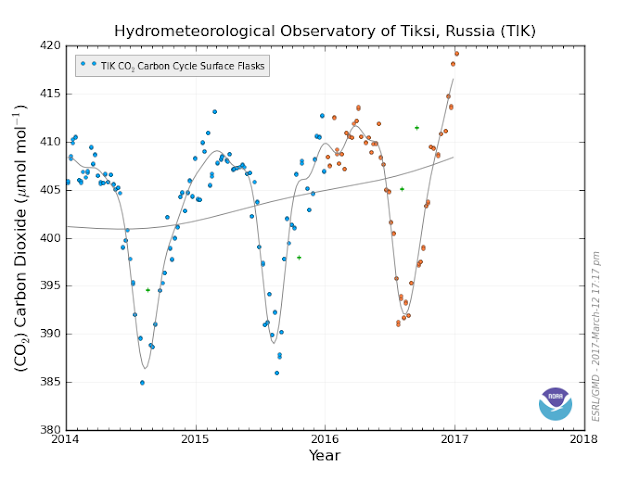 Finally, Tiksi, Russia has preliminary readings just shy of 420 ppm, and those will likely go higher later this spring if previous years represent a pattern for its increase in the next few months. While Mauna Loa is important as the longest running CO2 concentration reporting site, it is not the first to pass 410 ppm. 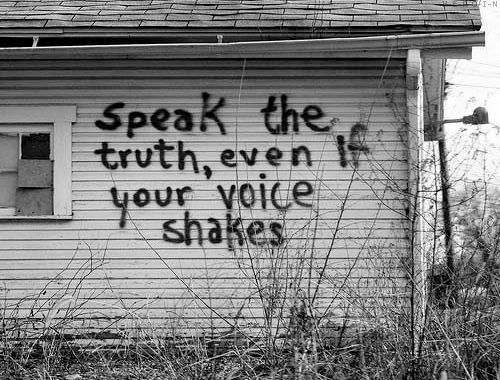 That was done last year in numerous locations. It is just catching up. 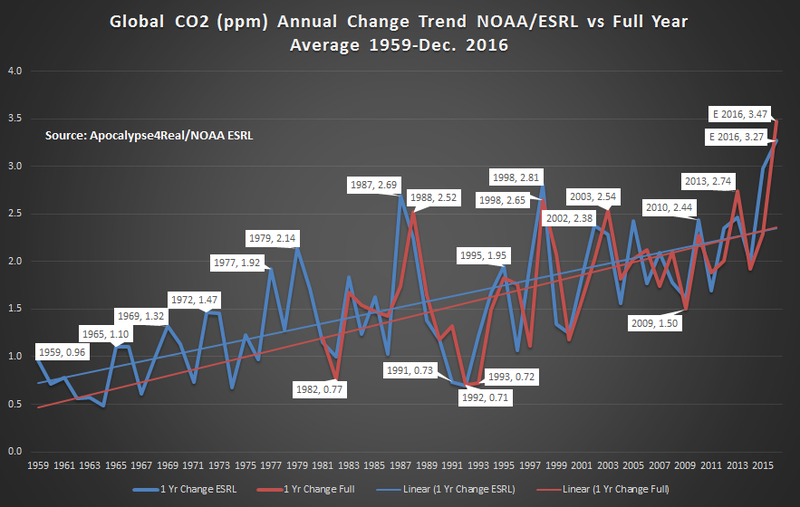 NOAA ESRL issued its December, 2016 Global CO2 report on March 5th. It supplied another sobering benchmark to those coming in rapid succession during the last three years. For December, 2016, ESRL reported a preliminary global CO2 of 404.70 ppm, or 3.27 ppm above December, 2015. 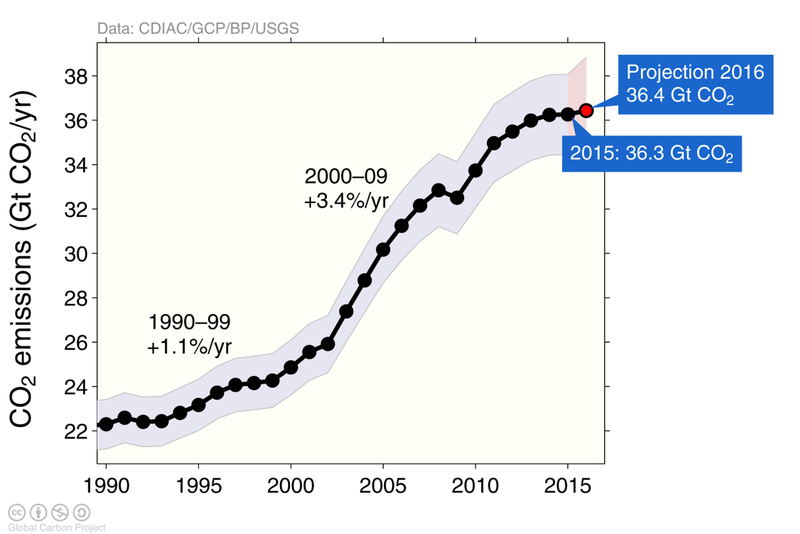 The monthly global trend, observed since 1980, depicts the accelerating rise of atmospheric CO2 concentration. 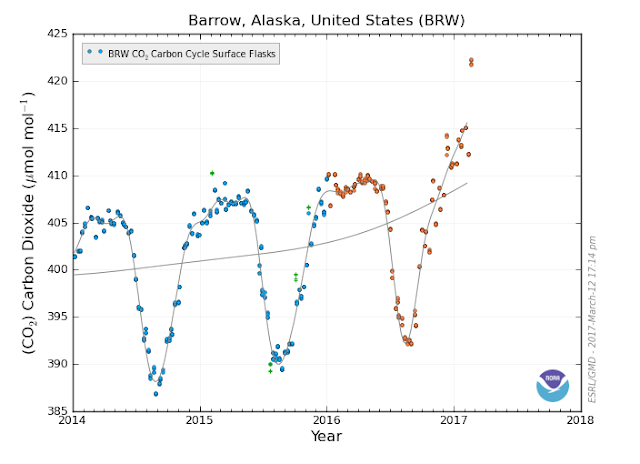 This is the 12th consecutive month with global CO2 year to year monthly increases above 3 ppm, which is unprecedented since Keeling began measuring CO2 at Mauna Loa, Hawaii in March, 1958. 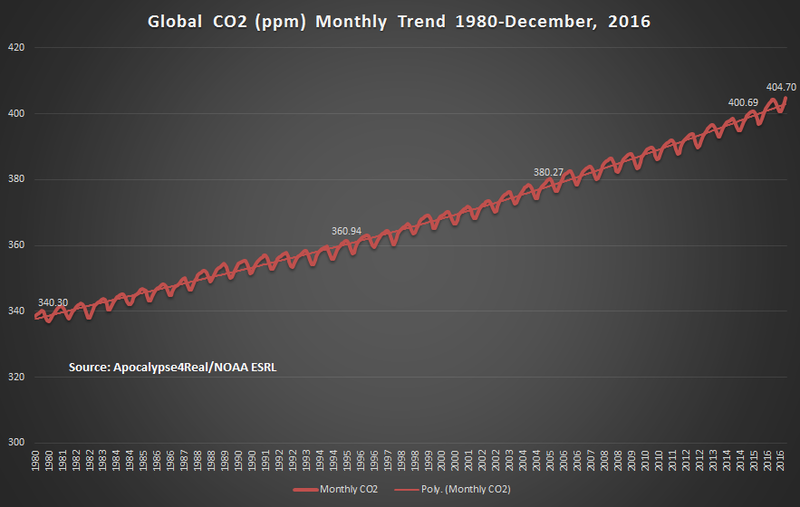 The December, 2016 CO2 concentration of 404.70 ppm is another record high for the month, and is 3.27 ppm higher than 2015. This is off the El Nino fueled peak change of 3.81 ppm recorded in July, 2016. 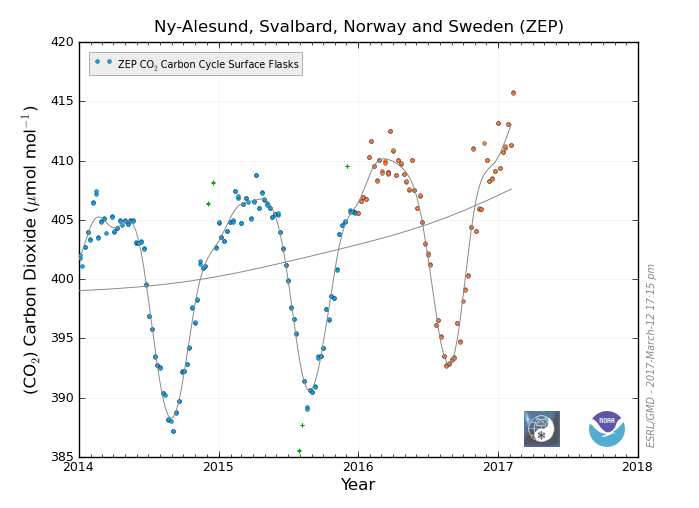 While it is likely that this rate of change will decline below 3 ppm in 2017, it seems very unlikely that it will drop below 2 ppm during 2017. 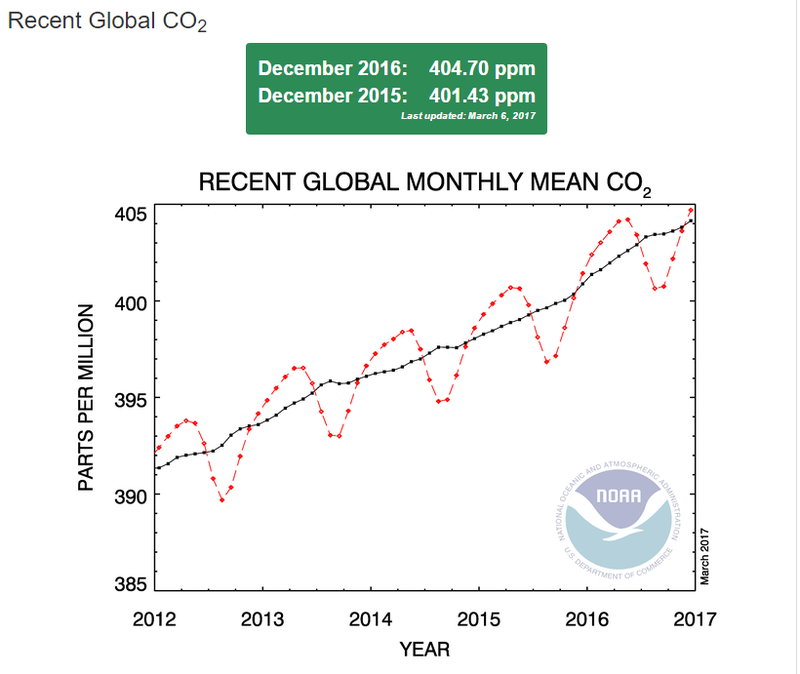 December, 2016 is the 24th month of year to year CO2 increases above 2 ppm. The last month with a global CO2 monthly increase below 2 ppm was January, 2015. The year to year monthly increases continue to accelerate as the trend line above indicates. What is most troubling is that this growth is not following a linear trend but a polynomial increase through time. 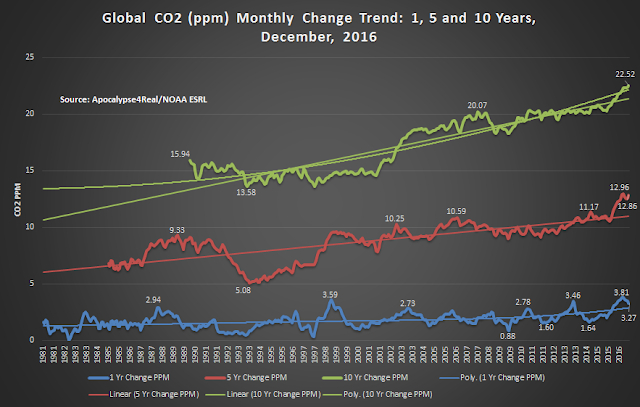 December, 2016 saw a five year increase in monthly CO2 of 12.86 ppm over December, 2011. This is only slightly below the 12.96 ppm five year change recorded in August, 2016. 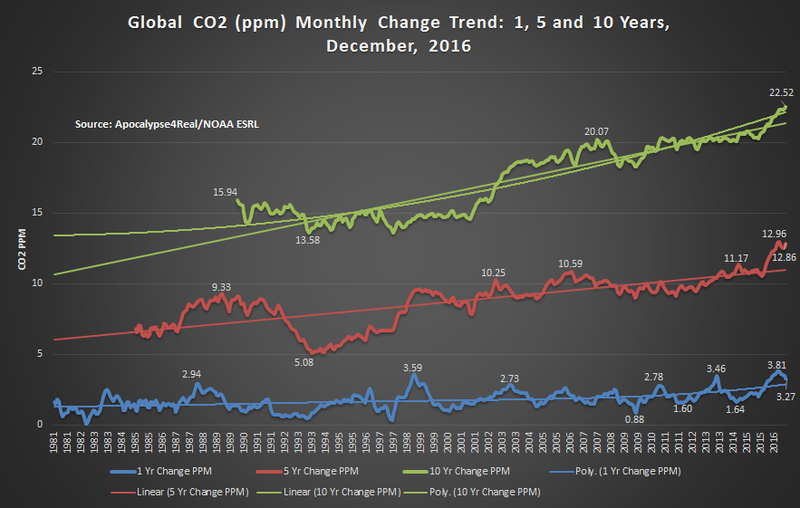 December is the 10th consecutive month of five year CO2 increases above 12 ppm, another unprecedented rise in global CO2, and far above its accelerating trend line. We have not experienced a five year monthly increase below 10 ppm since March, 2013, and it is unlikely we ever will again. 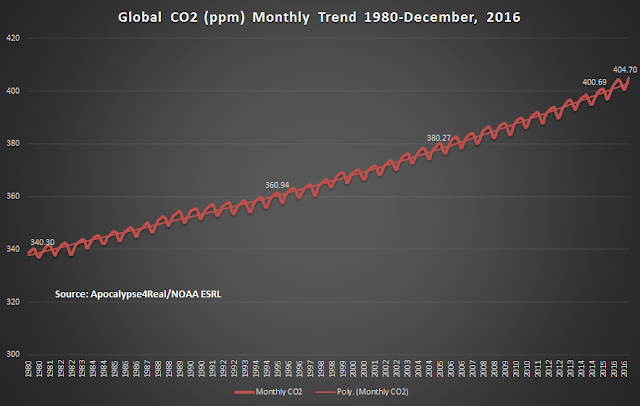 The December, 2016 CO2 concentration is 22.52 ppm higher than December, 2006. This is another all time record increase, and the 6th consecutive month with an increase above 22 ppm. We have not experienced a 10 year monthly increase below 20 ppm since October, 2012, and it is very doubtful we ever will again. According to NOAA ESRL, the annual mean 2016 global carbon dioxide growth rate is anticipated to be 3.16 ppm over 2015. Given their methodology is based on the average of December and January of the next year (2017), this seems conservative. If the December, 2016 monthly increase is 3.27 ppm, then this seems based upon an expectation that January's increase will be well under 3 ppm to meet the preliminary growth rate. Time will tell. However, if one uses the average of monthly increases of CO2 for 2016, then the annual increase for 2016 is 3.47 ppm over 2015. It seems more likely that the NOAA ESRL annual change will move higher once the January data is available. 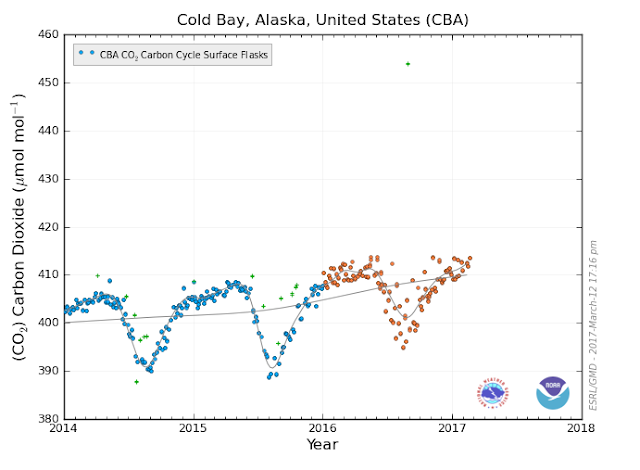 With the final adjustments to the annual change, it can be anticipated that 2016 will be the first year that the NOAA ESRL global CO2 concentration will experience an annual increase of more than 3 ppm. This is not good news for our world. Yet, we experienced continued high CO2 concentration increases during these years. The GCP position is that these concentration increases are due to declines in CO2 sink effectiveness, caused by drought and higher temperatures. 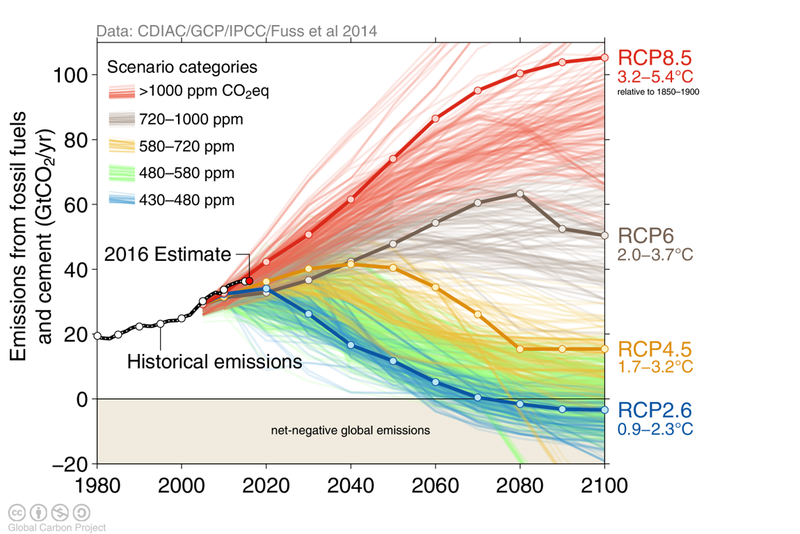 These CO2 increases hold us closer to the RCP 8.5 scenario, where it is perilous for humanity to tread. If true for Mauna Loa's CO2 data, how much more a real concern for the entire planet.